A nutritional supplement for calves suffering from a decreased appetite due to illness, weather stress and ration changes. 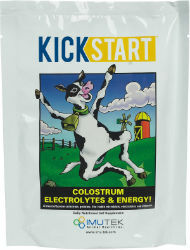 Dried First Colostrum + Electrolytes and Energy, Colostrum Fat and Proteins for Prolonged Energy. Easily Digestible Milk-Sugar Energy. More Energy than Sugar Based Electrolytes. Beneficial Microbials, Vitamins and Electrolyte. Recommended use: Calves with Decreased Appetite, Weaker or Run Down Calves, Scouring Calves, and Calved Needing a Nutritional Boost. Mix 1 pack in 1 pint of warm water and administer orally. Incoming calves: 1 pack daily for 2 days or sick pen 1 pack daily for 3 days after antibiotic therapy.